Elevated levels of mold and mildew have been detected in the air in two areas of an east Fort Worth police station that was recently evacuated by police employees over environmental concerns, a city spokeswoman said. Diane Covey said the elevated levels were noted in the building’s basement and near an air vent in an area with offices. Fort Worth police officials had “voluntarily relocated” personnel from the building on June 11 over what a police official described as “environmental concerns.” A source told the Star-Telegram that employees had arrived to work on June 10 to find a black substance in parts of the building, including under at least one air vent. On Monday, police spokesman Bradley Perez said two police department units are occupying the building. “However, the decision was made to keep personnel out of the areas still under construction to expedite the renovation,” Perez said in an email. The additional tests were done that same week to look for the presence of molds and other biological elements. The city received the results on Friday, Covey said. Covey said no visible black mold has been found in the building. The building at 3900 Barnett St., constructed in 1947, had been traded to the city by television station KXAS as part of an incentive agreement on a new complex the station built in the CentrePort Business Park near the Dallas/Fort Worth Airport. Officers and police civilians have been housed there while renovations have been underway, including adding a new elevator and renovating the HVAC system. Covey has said that since 2014, the city’s environmental quality department has repeatedly checked the building for possible asbestos fibers in the air, including after the black substance was found. She said the elevated levels will be addressed with detailed cleaning inside of the air handler. All those tests have come back negative, she has said. Black mold has been discovered at a correctional center in Greenbrier County, according to the State Division of Corrections. The mold was found at the Anthony Correctional Center in its main building. State Corrections Commissioner Betsy Jividen has decided to transfer 200 young-adult offenders to other correctional facilities while an inspection into the issue continues. According to the D.O.C., the women inmates will be moved to the Lakin Correctional Center in Mason County. The men will be placed in the Parkersburg and Denmar correctional facilities in Pocahontas County. Lori Wolfe/The Herald-Dispatch Anthony Correctional Center is located in White Sulphur Springs, W.Va.
CHARLESTON – The Anthony Correctional Center, a prison created as a place for youthful offenders in West Virginia to receive education and job skills training, has relocated its inmates and employees after black mold was found at the facility. The transfers were initiated by West Virginia Corrections Commissioner Betsy Jividen after she received initial findings from an ongoing inspection of the facilities, according to Lawrence Messina, director of communications for the West Virginia Department of Military Affairs and Public Safety. The final inspection report will help authorities determine the best course for the future of the center. The Anthony Correction Center is a minimum-security facility based in Greenbrier County. It houses about 200 young-adult offenders, both men and women, from West Virginia. The program takes anywhere from six months to two years to complete and gives educational courses to offenders, while also teaching them job skills applicable to the real world. It was first built in 1965 as a federal Civilian Jobs Corps Center before the West Virginia corrections took over the property in 1970. Initial findings identified a black mold in just one of the campus’ half-dozen buildings, which houses the administrative offices, facility kitchen gym and some housing units. With that information and the inspection continuing, Jividen concluded the transfers were needed, Messina said. No staff or inmates have exhibited any symptoms of exposure to the mold, but all parties will be monitored in case symptoms appear in the future. The women have been moved to the Lakin Correctional Center, while the men will be divided between the Parkersburg and Denmar facilities. The inmates will continue to receive the statutory education and training needed to complete the program. About 100 staff members, including about a dozen Department of Education teachers, will also be moved to different facilities. Although, they will be moved to nearby facilities with the goal to avoid unnecessarily long commutes. The Correctional division is sharing the inspection findings with the state Bureau for Public Health, which has also visited the facility. The Greenbrier County Health Department has also been notified, according to Messina. From January 2017 to March 2018, the UMW maintenance department received 47 reports of mold and mildew in various campus buildings, according to work orders obtained through a Freedom of Information Act request. An analysis of these reports shows that the cases were not resolved in a timely fashion, even when students had health concerns. In addition, response times started slowing since the summer of 2017. Of the 47 reports, 19 were completed. Another 19 were assigned, which means that an employee was given the case but the work orders were not yet complete. Maintenance services at Mary Washington says the assigned, but not completed, work orders is just a problem of documentation. “I have good reason to believe that the work was in fact accomplished but we did not properly document the work performed in the current work management system. I came aboard UMW Facilities Services last fall and am now implementing a new work order management system for Facilities Services which should be “live” by Fall 2018. The new system will provide improved documentation of status and completion,” said Nolan J. Akau, director of Maintenance Services in an email. But students complaining about mold have a different account. In at least one case a student claimed to have reported mold in their dorm three times before receiving a response from maintenance services. The student’s identity is unknown because of the Family Education Right and Privacy Act, which voided all student’s names from the FOIA. “This is the third work order request we have submitted to have someone remove the black mold that covers 1/3rd of the ceiling in our dorm room. It has been there since we moved in Fall 2017, however, no one has come to look at it,” said an unnamed student living in Alvey Hall according to the work order filed on March 18, 2018. The remaining nine reports of mold were rejected. In many cases, they were told that cleaning would take place in the summer. In the meantime, students were expected to live with mold until the end of the semester. This was in spite of the fact that many were experiencing health problems. For example, an anonymous student who filed a report on April 10, 2017 had a work order rejected because it was filed at the end of the semester. The identity of the student is unknown because it was blacked out on the work order received with the FOIA. “I haven’t been able to sleep in my room because it affects the way I breathe and it’s right under my bed,” said the unnamed student living in Virginia Hall according to their work order. There were a variety of other reasons for rejection. One of the work orders from November 12, 2017 was rejected because the student living in the University of Mary Washington Apartments reported mold on the university-provided shower curtain liner. “Housekeeping does not supply replacement shower curtains; curtain should be cleaned or replaced by the residents,” according to the work order rejection reason. But in an email from Akau explaining maintenance procedures to remove mold, he stated the university does not clean the shower curtains. They replace the curtains instead. While the university did not replace the student’s shower curtain from the November 12 work order, the university did replace a shower curtain in Mason Hall, according to a different work order filed January 23, 2018. In the 2017 to 2018 calendar year, the work order requests that were completed received a response time within an average of four days. This average does not include assigned work orders or the ones that were rejected. But since August 2017, the response times have been greatly lagging. Many of the reports of mold have been assigned, but not addressed. Of the 24 work orders filed between August 28, 2017 to March 18, 2018, only seven of them were closed and two were rejected. The other 17 work orders were assigned, but not completed. Out of the 47 reports, 13 of the cases were reported from Alvey Hall, which has more reports of mold than all other university housing and buildings. Eagle Landing has seven reports of mold, while the University of Mary Washington Apartments and Marshall Hall have reported four cases of mold each. The general procedure to remove and clean mold off of walls, floors, windows and AC vents is to first clean the affected area with Hill Manufactured Mildew Stain remover and a microfiber cloth. After the surface is dry, maintenance then sprays the surface with the stain remover again. They then apply Anabec, which is an antimicrobial to seal and protect the surface from mold in the future. The University of Mary Washington currently has 30 maintenance employees and 30 housekeeping personnel working for facility services. Additionally, the university uses over 50 outside contractors. The outside contractors occasionally address mold in university housing and buildings.According to a study conducted in 2003, “Effects of Toxic Exposure to Mold and Mycotoxins in Building-Related Illnesses” exposure to mold can cause a variety of health problems. The study consisted of 61 females and 39 males, a total of 100 subjects who all had mold in their homes. The results showed that 64 patients exhibited respiratory problems. Out of the 100 patients, 70 exhibited short-term memory loss and dizziness, these symptoms are associated with neurological symptoms. All of the patients exhibited immunological symptoms such as hypersensitivity to molds, foods and chemicals. Some students have mold in their dorms and do not even know of its existence. For example, senior Alex Sakes, a political science major and business administration minor, found black mold next to his bed on move out day of his junior year while he was living in Arrington Hall. Sakes only discovered the mold after he removed the poster it was growing under. Sakes believed the mold grew because his walls regularly leaked and the mold was near his AC unit. “Little did I know the entire year I was sleeping next to an entire wall covered with spores of black mold,” said Sakes. After discovering the mold, Sakes filed a work order. The following academic year Sakes’s friend, 22 year-old ancient civilization major Sarah Attkisson, moved into his old dorm. Attkisson graduated in 2017. According to Attkisson in an email, there was a lot of mold in her room which was difficult to clean and always came back due to the heavy moisture in the building. Attkisson lived in Arrington from 2014 to 2015. 21 year-old Brooke Talkington, a Spanish major who graduated in 2017, had encountered mold in university housing. The incident with the mold occurred from September to October 2017. At the time Talkington lived in the UMW Apartments in building seven. “In our experience the apartment above ours had issues with their shower draining, causing water to pool in our ceiling where mold grew and a section of the ceiling eventually collapsed,” said Talkington in an email. Talkington and her roommates filed a work order. However, they did not receive a response after three days and went to their RA who submitted another work order and contacted the area coordinator. “The shower in the apartment above us was fixed within days but it took about 3 weeks for maintenance to come replace our ceiling. My roommates and I were understanding that they are busy and there are other people on campus with issues, but we felt that it took a really long time considering the fact that mold is a health issue,” said Talkington. The Blue & Gray Press published two stories on the topic of mold in dorms back in 2015. One article was based on an incident in Alvey Hall and the other was about Eagle Landing. As a result of these articles, the newspaper received several other complaints from students who had experienced mold in their dorms. The paper did not follow-up on the issue until now. According to Akau’s email, the University of Mary Washington is currently searching for options to improve preventive measure to reduce mold issues in the future. The university also plans on renovating the older buildings. A contractor hired by Wellington began this weekend to demolish a multifamily home riddled with a dangerous strain of mold. 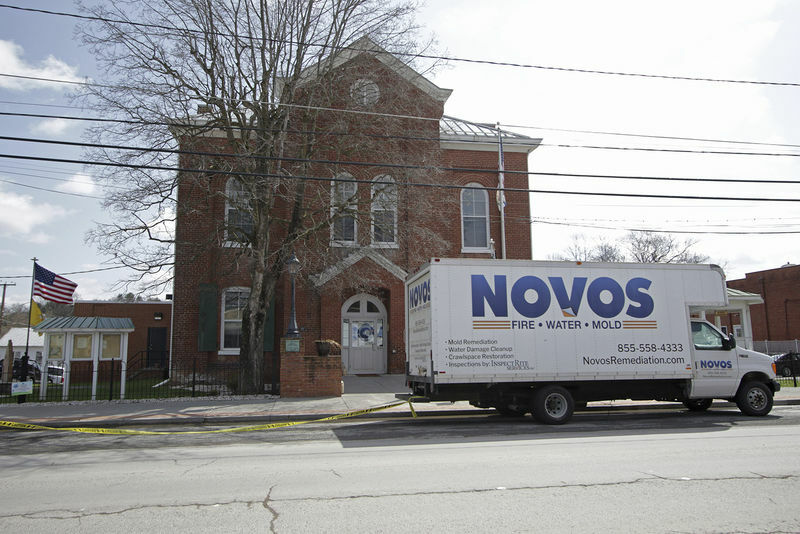 A contractor hired by Wellington began Friday to demolish a property the village had determined was unsafe after inspectors found high levels of mold, including Stachybotrys, better known as toxic black mold. The mold was visible under sinks and behind kitchen cabinets in the White Pine Drive property’s four units, but a mold remediation specialist hired by Wellington found evidence of moisture in the exterior walls — a sign of larger structural issues, officials said. The village made the decision to demolish in January. BG Group started its work Friday evening and continued through Saturday, Wellington building official Jacek Tomasik said. He visited the site Monday morning as crews loaded chunks of concrete, steel, drywall and other debris into trucks. Tomasik was in the pair of attached buildings several times before they were demolished and said he had trouble breathing while walking through the units. He was concerned when he saw children in the homes. This is the third private-property demolition for Wellington. The most recent, “the blue tarp house,” a multi-family home formerly at 13932 Folkstone Circle known for the blue tarps that covered parts of its roof for years after the hurricanes of 2004 and 2005, was demolished in 2014. Tomasik expects the total cost of the demolition to go a little above $30,000, which will be placed as a lien on the property. Once the concrete is removed, crews will make sure the land is level before adding sod or grass seed to complete the project, Tomasik said. The property is owned by West Palm Beach-based AIG Enterprise Corp., but Wells Fargo Bank began foreclosure proceedings last year, court records show. Since February, village attorney Laurie Cohen has been working through the courts to notify both the bank and AIG of the plans to demolish. A Palm Beach County judge approved an April 6 deadline for the bank to provide Wellington with plans to completely clean up the mold, but the bank missed the deadline. Cohen said the property owner also had that amount of time to submit plans. AIG corporate officer and property manager Isaac Antoine submitted a permit application and payment before the April 6 deadline, but there were no plans with the permit and the check bounced, Wellington building officials said last week. Antoine then submitted plans to redo tile in the kitchens and bathrooms, but those plans were not sufficient to deal with the extent of the mold, officials said. “Both the bank and the property owner had more than ample opportunity to come in with some plans, and neither did,” Cohen said. 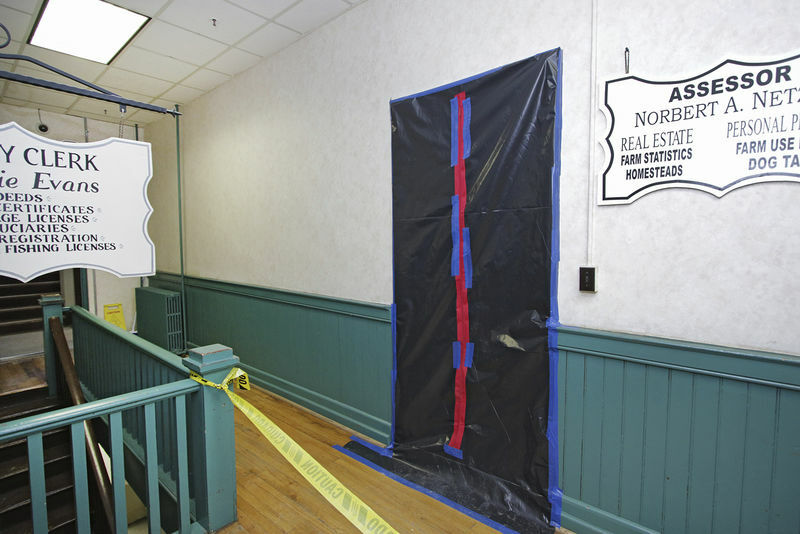 Hopes of keeping the Monroe County Courthouse open for business while mold remediation takes place were dashed Monday evening with the announcement that the entire building would be closed from Wednesday through the end of the week. In a brief statement, County Commission President Shane Ashley apologized to the public for the inconvenience of the building’s closure and stated that the courthouse would reopen “for regular business” on April 16. InspectRite’s Roland S. Jones warned county officials in a undated letter addressed to County Clerk Donald Evans that “considerable containment” of the affected areas would be necessary during the remediation process due to the increased risk of exposure to the contaminants as walls and ceilings were opened, disturbing the mold. “Obviously, each specific area being remediated must be totally vacated during remediation,” Jones wrote in that letter. Among the contaminants identified by InspectRite’s testing was stachybotrys — more commonly referred to as “black mold” — which is quite common in buildings and homes, according to the Centers for Disease Control (CDC). “Standards for judging what is an acceptable, tolerable or normal quantity of mold have not been established,” the CDC says. In an online summary, the CDC rejects the term “toxic mold,” saying while certain molds can produce toxins, the molds themselves are not poisonous. But even though molds like stachybotrys and the others (chaetonium, aspergillus and rhincladiella) identified as being present in the Monroe County Courthouse are not inherently toxic, common sense dictates that such contamination should be eradicated, the CDC says. People who are sensitive to molds may exhibit symptoms when exposed to contamination, according to the CDC. Symptoms may include stuffy nose, wheezing and red or itchy eyes or skin. Severe reactions may include fever and shortness of breath, and exposure to mold or dampness may also lead to asthma in some sufferers. City workers in the small town of Arcola are trying to figure out next steps after being told to leave city hall last month because of mold found inside the building. “We can’t do anything. Traffic tickets, nothing. We can’t operate the city,” said Mayor Mary Etta Anderson over the phone Monday. Three types of mold, including black, were discovered in the building in January after staff workers continued to fall ill. City workers were told to leave in late March and have not been back in the office since then. Arcola, made up of about 2,000 people, sits next to Fresno and about 25 miles southwest of Houston. City council members first were made aware of the mold in January, but have yet to agree on how to come up with a financial solution to the problem. City council members could not be reached for comment as of Monday afternoon. Some city workers contacted attorney LaShawn Williams, whose office sent notices to the city, to allow the employees to work from home or take time off due to the health conditions. She said employees contacted her after complaining of rashes, headaches and hair loss. Anderson, who first became mayor in 2008, said two trailers are going to be set up in front of city hall, so that workers can have a safe environment until the mold problem is resolved. Williams said that city workers are still unsure of the full health hazards they may have suffered as a result of the mold. Torres thinks the slow response from council members could be their lack of exposure to the building. In the meantime, Torres said he’s reaching out to neighboring police agencies for help and his officers are still responding to emergency calls in progress. “Where do our officers go to file a police report? Where do they go to file their citation? These are some of the challenges that we’re currently facing that we’re trying to overcome,” said Torres. WATERLOO — The former St. Mary’s Church and School has been listed among the state’s “most endangered” historic structures by a preservation advocacy group. Preservation Iowa designated the vacant and decaying buildings on the corner of East Fourth and Parker streets in Waterloo as one of 13 statewide historic properties at risk of disappearing. Water was allowed to collect in the basements of the buildings, which led to black mold. Flooring has warped, Broken windows have left the structures at the whim of the elements. “Now there are many in the community calling for the buildings to be bulldozed and the property to be developed,” the Preservation Iowa report stated. Preservation Iowa is a nonprofit organization that uses the endangered building list to shine a spotlight on historic buildings in need. The listing does not qualify projects for funding or put any requirements on property owners. St. Mary’s Church and School was built in 1922, originally serving many immigrants settling in that eastside area of the community. Waterloo’s famous five Sullivan brothers, who were killed during World War II while serving aboard the same U.S. Navy ship, worshipped and went to school there. A convent and rectory were added to the property in 1956. The last nuns moved out of the convent in 1984, and it was converted into senior housing known as St. Mary’s Villa. St. Mary’s Church stopped holding services in 2003 when several parishes were combined and the school was renamed Queen of Peace. The Cedar Valley Catholic Schools Board of Education then closed the school and shut down St. Mary’s Villa for financial reasons in June 2006. All of the buildings were sold Dec. 29, 2006, to Henry L.N. Anderson of Los Angeles for $475,500. But the property has remained vacant while Anderson has failed to maintain or pay property taxes on the property. The Black Hawk County Treasurer’s Office notes unpaid taxes and special assessments for city code enforcement actions have grown to nearly $108,000. Anderson has recently indicated his willingness to pay a portion of those taxes, but no money has been received as of Wednesday. City Attorney Dave Zellhoefer said he is in the process of preparing an application to seize the property under Iowa Code Section 657A. Should the city win its court case, taxpayers could be on the hook for demolition costs and City Council members could find themselves arbitrating between those who want the buildings saved and others who believe they should come down. City engineering officials also indicated the rectory may need to be demolished for a Virden Creek levee project.